CFZ Australia popped in to talk to Col Bailey recently on a sojourn to the Apple Isle, Tasmania, just last week. Thylacine seeker Col Bailey has a new book in the works due out next year, which details among other things his own sighting in southwest Tasmania's rugged bushland on an expedition in 1995. "I was trembling like a leaf. It was surreal. I had no idea how I would react,'' Mr Bailey, 75, told the Herald Sun earlier this year. He said the officially-extinct carnivore appeared while he was camping in Weld Valley and he followed it beyond a cluster of ferns. "It was about 15 feet away and it turned and looked at me for several seconds, then backed away,'' he said. Mr Bailey said it stopped and looked at him a second time before it disappeared into the scrub. In approx. 1990-1992 my Son,Troy and his mate, Simon,both about 17-18yrs old and Troys dog Bullet were driving the bush tracks around Mt. Sugarloaf (Newcastle, NSW) when they saw in the headlights, what they first thought was a greyhound. They stopped and the boys stepped out of the car close to the open doors, to get a better look. 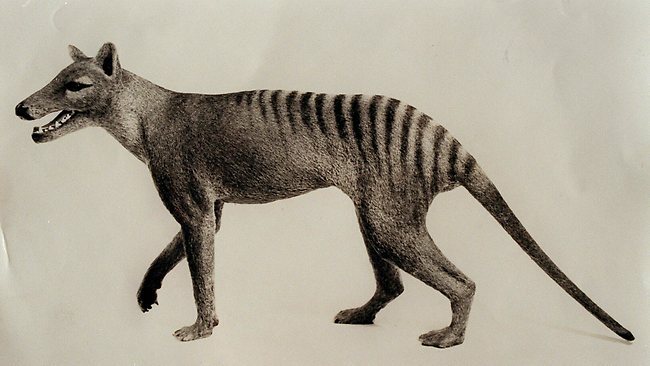 They said it was definitely a Tasmanian Tiger. The Jaw, stripes and tail made such an impression on the boys but so did Troys dog,Bullet... He absolutely REFUSED to get out of the car!! That was so unlike him. Troy says there are so many caves in that area for an animal like that to live in. I was speaking to a friend in a supermarket in Newcastle about it and a lady in the queue butted in and said her son and his mate also saw one up at the Chichester Dam. They went back with cameras and lighting and rifles but didn't see it again.